Home sales fell an annualised 26.9pc in June, and prices 13.3pc, according to the latest data from Spain’s Council of Notaries. Home sales are now just a third of what they were each month in 2007, at the tail end of the boom. Average house prices in june were down to 1,206 €/m2. 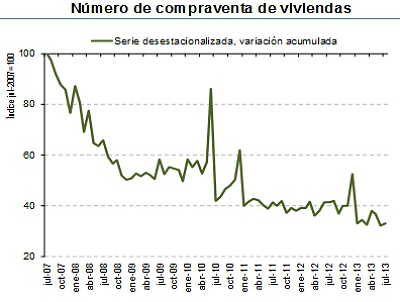 The figures come from home sales witnessed by Notaries in June. These are the freshest figures the market has. They will show up in the house sales figures published by the National Institute of Statistics in a couple of months time, once the sales have been inscribed in the Property Register. Analysed by type of property, sales of apartments (excluding social housing) fell 23pc in June, though newly-built apartment sales fell the most, down 46pc, whilst resale apartments were down just 14pc. Single-family home sales were down 23pc. Peak-to-present, property prices have fallen 34.9pc since the summer of 2007, according to the Notaries. Thanks for the news item. However, I was wondering if there is a link to see more detailed info by region. I was in Barcelona last week and noticed prices reduced on flyers advertising properties yet some of the property portals still show m2 prices somewhat higher than I expect.